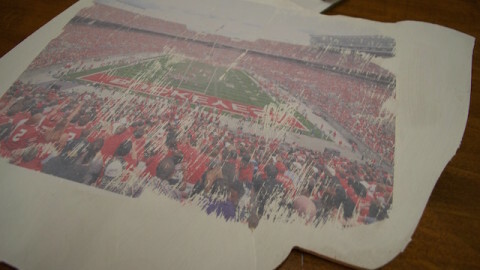 Hosting a party this weekend for Ohio State’s first game of the season? O-H! 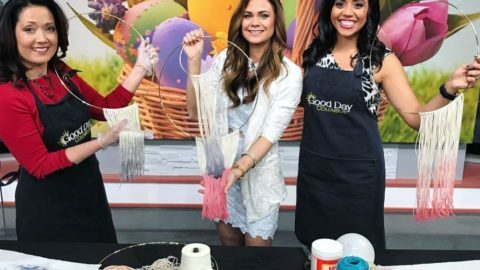 This is for beginners, and the kids can do it, too! 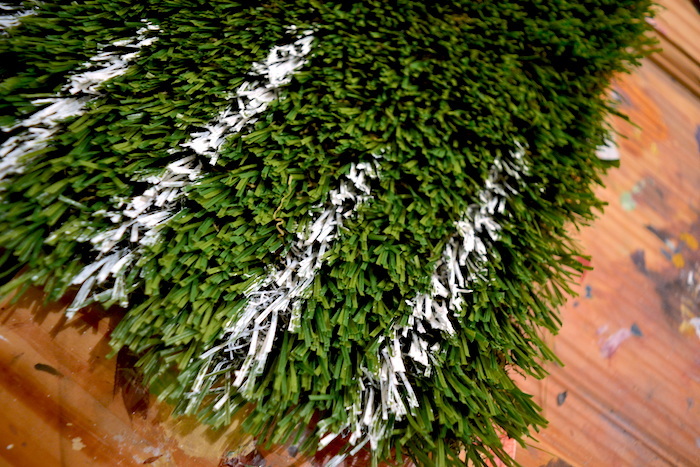 -artificial turf (about 12″x12″ per placemat) *you can purchase them on Amazon here. 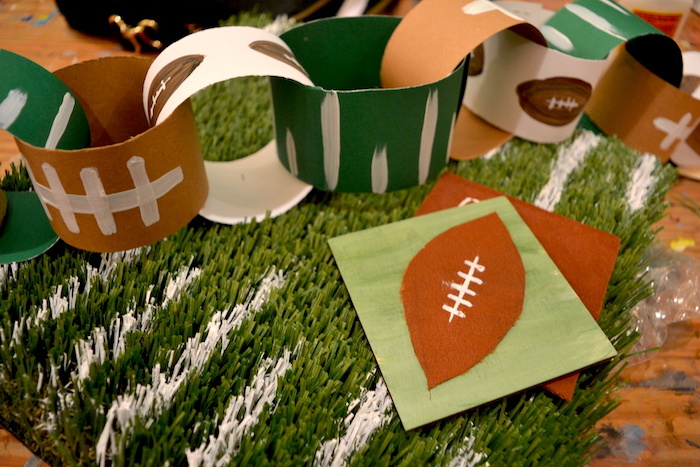 Step 1: The first step is to cut your artificial turf to be the exact size you’d like for each potholder or placemat. This could get messy, since you’re basically cutting grass, so be sure you have a broom nearby! 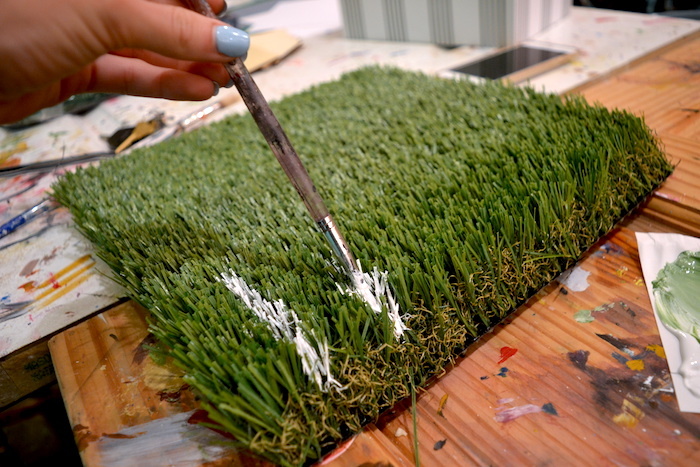 Step 2: If you think the grass is a bit too high, just trim it down a little bit everywhere to make it appear shorter. You may want to place some bowls and plates on top of the grass first in order to determine if you want it to be shorter. Step 3: Once you have all of your potholders and placemats cut to the correct size you want, it’s time to add the white yard lines! 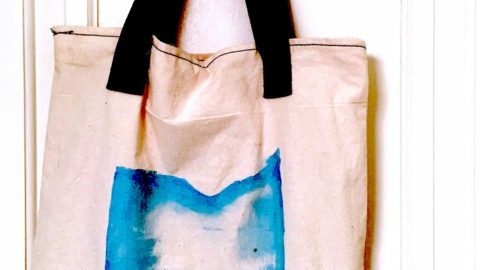 Squeeze a dime size of white acrylic paint onto a paper towel, paper plate, or paint palette. Step 4: Now use your paint brush dipped in the white paint to use a “dabbing” motion in order to thickly apply the paint in a stripe starting from the outside and working your way inwards. Make that stripe about 3 inches long. Now, repeat that step but make the stripe half the length of the previous one. Alternating sizes, you’ll then continue all the way across one side of the square. See the photo below. Step 5: Now, you’ll want to do that same exact thing to the opposite side of the turf so that it mirrors the stripes on this side (just like in the photo!). Now you see the pattern here! 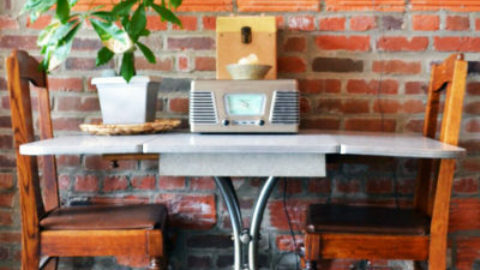 Step 5: Set the table, and listen as your guests exclaim about how cute the place mats are. Then, pat yourself on the back. You’re a true athlete AND artist now. Step 1: Either paint or color the coasters using green paint and your large paint brush (or just a green paint pen or marker). Step 2: Allow that to dry completely. 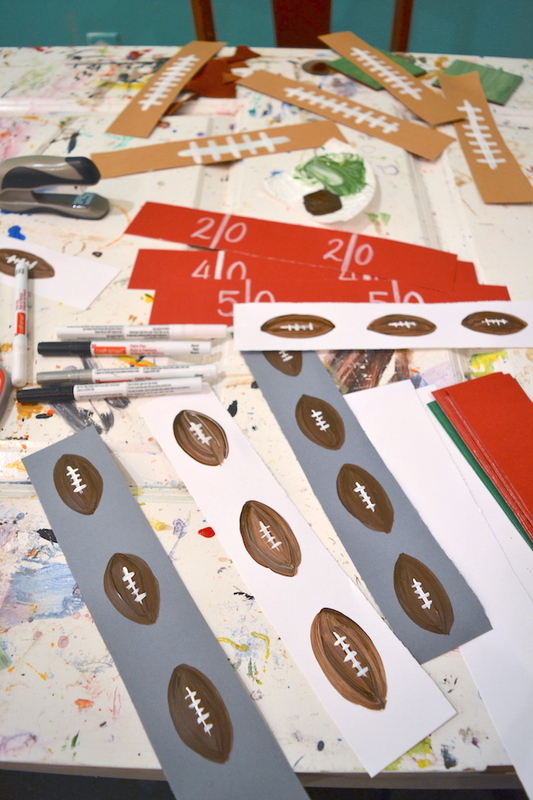 Step 3: Draw a football on the leather using your pencil or pen, and cut it out accordingly. Be sure that this football will fit perfectly across the coaster and isn’t too large or too small. 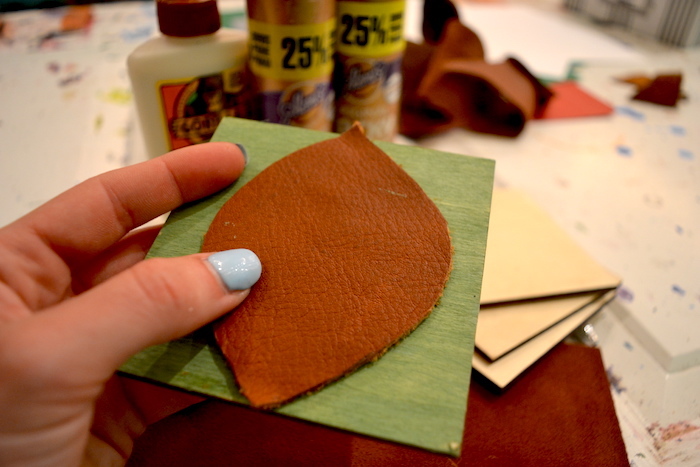 Step 4: Once the coaster is dry, we are ready to glue the leather football down to it! 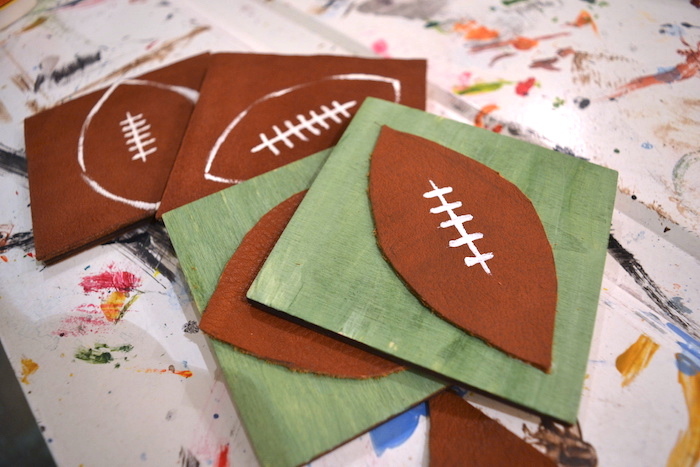 Step 5: Glue the leather football shape down to the coaster on the green side that you painted (which should definitely be dry by the time we’re at this step). 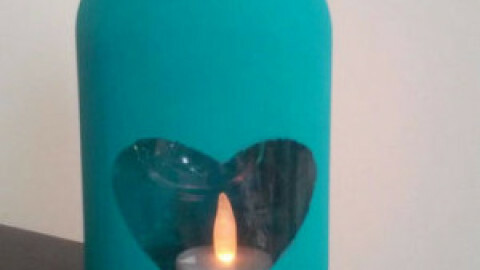 Step 6: Let the glue dry. 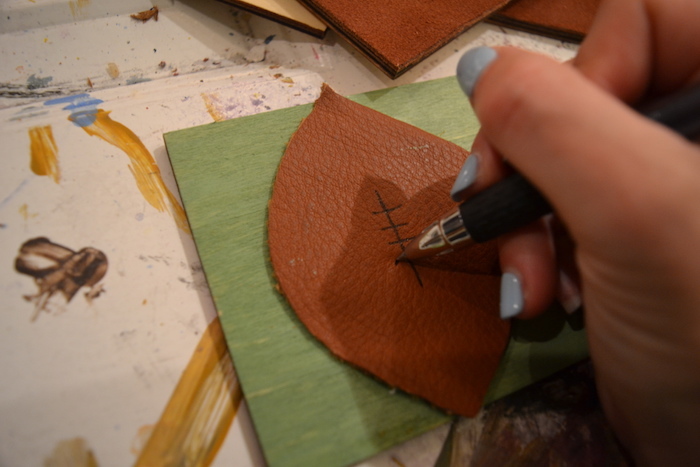 Then, use your pen or pencil to draw one 1″ line across the center of the football where the stitching will be. Also, draw the stitches in (about 5). Step 7: Now, we’re ready to use our tiny brush and the white acrylic paint to paint over top of those stitches. Let dry, and enjoy your new coasters! 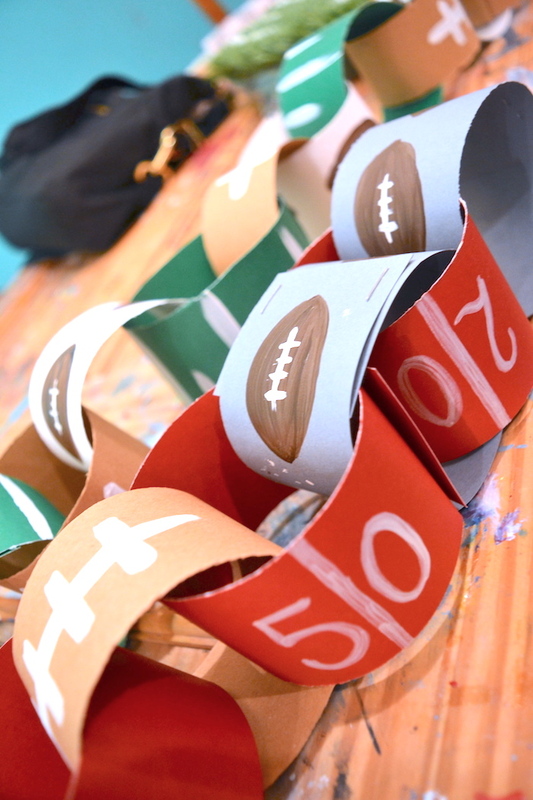 Step 1: Measure, score, and cut your 2″ thick strips of paper from the cardstock. You can probably cut multiple pieces at once depending on how great your scissors are! 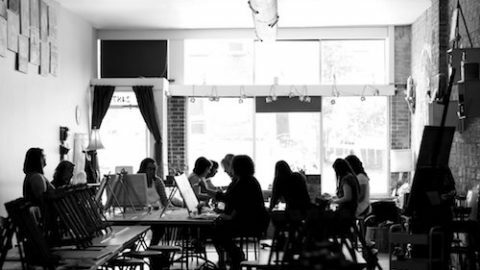 Step 2: Decide what you’ll be painting on each strip. I painted yard lines on some of them using white paint pens. 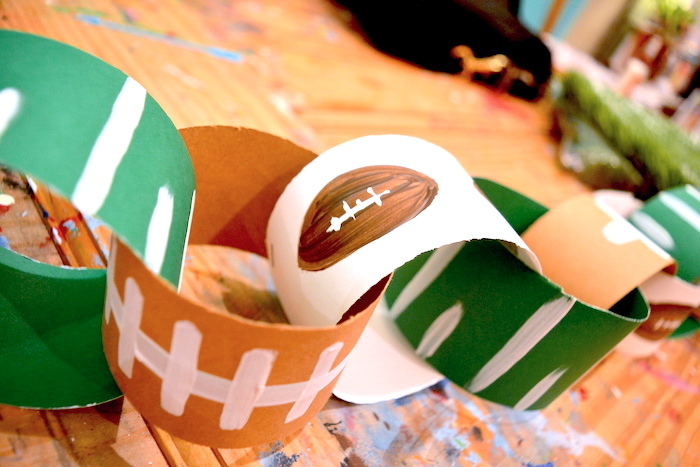 Then, I painted small footballs on others, and just designs on the rest. Step 3: Let all of these strips dry before moving on to attach them. Step 4: Now that they’re dry, we can staple them together in circles to create a growing chain. Step 5: Either hang the chain from the ceiling, from your food table, or just display it in front of the television or on the mantle! It really can be anywhere! Thank you again TEAM GDC! Happy FOOTBALL SEASON to all of the wonderful family and friends out there watching. Stay patriotic and safe this weekend! And good luck everyone with their Fantasy teams!